We live in a time when social media isn’t just about sharing pictures or ideas with a close circle of friends and family. Between our Facebook statuses, our Twitter profiles and especially our LinkedIn pages, we are always public, all the time — no matter what your privacy settings may have you believe. For people in the health care industry, the line between the professional and the personal is a particularly difficult one to navigate in the digital realm. It’s perfectly natural to want to use social media as a platform to vent about a trying day, to source new opinions on a difficult case or even to humblebrag about a job well done. But doing so may put your job — and your entire health care career — in jeopardy. Social media conduct is a thorny issue in the health care sector, where HIPAA rules and patient confidentiality are extremely important but also all too easy to break. Sometimes, the violations are fairly obvious and egregious, like the doctor who posted pictures of a young female patient being treated for extreme intoxication to Facebook and Instagram or the nursing home staff that sent Snapchat photos of residents in private moments to friends while on the job. Other times, a social media post may seem perfectly benign or even friendly but still breach protocol. A number of ER staffers were fired for offering their condolences for a police officer killed in the line of duty on Facebook before his family was even notified. A nurse who posts a selfie with his favorite patient without consent or who makes an identifying comment in a Tweet about the man who had a heart attack or the young girl who attempted suicide: these are all HIPAA violations, even if you think your account is private. Was Jefferson right to fire an employee for a social media post made outside of work, or should the nurse be allowed to say whatever she likes under the First Amendment protection of free speech? It’s not a philosophical question up for debate: There is a right and a wrong answer. 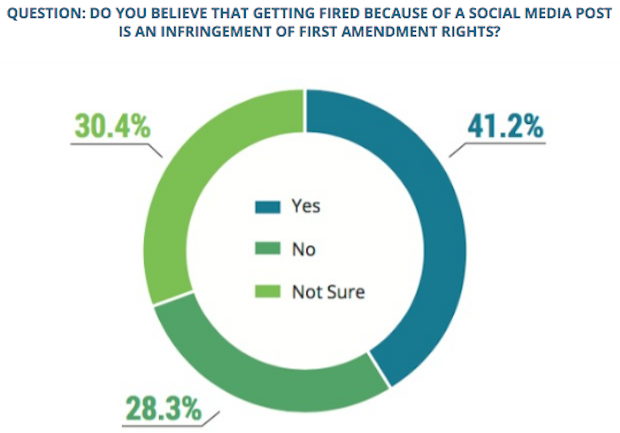 In most cases, the First Amendment does not protect employees from being fired for anything they post, say or do on social media. Many workers remain painfully unaware of this fact. In other words, roughly seven in 10 workers don’t understand how their online actions could affect their professional lives. We often use social media as an extension of our personalities, so it’s no wonder that employers would measure how current staff or potential hires conduct themselves online to gauge their behavior in the workplace. It doesn’t all have to be negative, though. A survey of recruiters found that 55 percent had reconsidered a job candidate based on their social media profiles, and while 61 percent of those reconsiderations were unfavorable, the remaining 39 percent were positive. Social media is just that: social. It’s meant as a public forum, and it needs to be treated like one. Workers in the medical industry need to be especially careful about how they discuss work-related issues online and should be aware of how their actions might reflect their ability to inspire trust in a general public that requires dependable, quality care. Sandra Canosa is a writer, Careers by KevinMD.com.